This entry was posted on July 28, 2018 by Texas Safety Supply. HexArmor Rig Lizard Impact Gloves ( HexArmor 2021 ) is one of the top gloves from HexArmor Imapct Gloves available for purchase. HexArmor Rig Lizard Gloves have a heavy duty durable palm that provides Level 4 Abrasion resistant. These Impact gloves are gonna last. 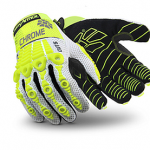 The grip of these HexArmor Impact gloves is designed to repel oil and improve grip. The great thing about these HexArmor gloves is that users say they are comfortable and also provide great finger tip sensitivity. The dexterity allows Oil Field workers to do their job more efficiently. Fully covered Thermo Plastic Rubber provides great back of the hand protection. HexArmor Rig Lizard Cold Weather Impact Gloves 2023 are great when HexArmor winter impact gloves are needed. These HexArmor Winter impact gloves are protected by Thinsulate and provide a waterproof barrier to keep the hands warm and dry. HexArmor Impact gloves with synthetic Leather Palm provides additional barrier protection. HexArmor Rig Lizard Arctic Impact Gloves are a dependable friend in the oil fields providing warm hands in freezing temperatures. 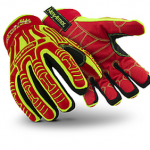 Call On HexArmor Winter Impact gloves to get the job done. HexArmor Chrome Impact Gloves are a HexArmor Cut Resistant Impact Gloves with ISEA Cut Level 5 protection. HexArmor Chrome 4080 Impact Gloves offer the newest and best technology available for HexArmor cut resistant impact gloves. The leather on these HexArmor Impact Gloves with cut resistant are comfortable and great to use and wear in the oil and gas business. These HexArmor Cut resistant gloves have a leather shell with a patented cut resistant fabric sewn into the interior layer. HexArmor Chrome 4080 are some of the best cut resistant impact gloves available. 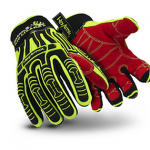 Provide top notch and the best impact gloves available with HexArmor Impact Gloves for yourself and employees. HexArmor 4030 Hexvent Cut resistant impact gloves are a solid solution for impact and cut protection while making sure the hands do not overheat while on the job. HexVent technology allows for breathable back of the hand allowing heat to vent and and the grip to remain solid and dry. These HexArmor Impact Gloves provide ISEA Cut level 5 fabric through the patented SuperFabric blend built into these HexArmor Cut Protection Gloves. 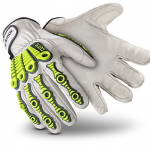 A PVC and synthetic leather palm helps your grip stay solid in both dry and light oil work situations. The Index finger and thumb crotch are both reinforced to ensure the longevity and use of these Cut Resistant impact gloves. A great choice for hot weather and cut protection. If looking to buy Impact Gloves Wholesale or Impact gloves discount price plans please contact our office at 214-764-3527. Please contact us for all work Gloves in bulk.